I meant to publish this a while ago, but tedious distractions like earning money got in the way - c'est la vie. Received wisdom holds that there is nothing better than other people's money. I have little experience of this, remaining open to any offers you might care to make in that regard. I am, however, an enthusiastic convert to the concept of other people's greenhouses, especially when they're frost free all winter. 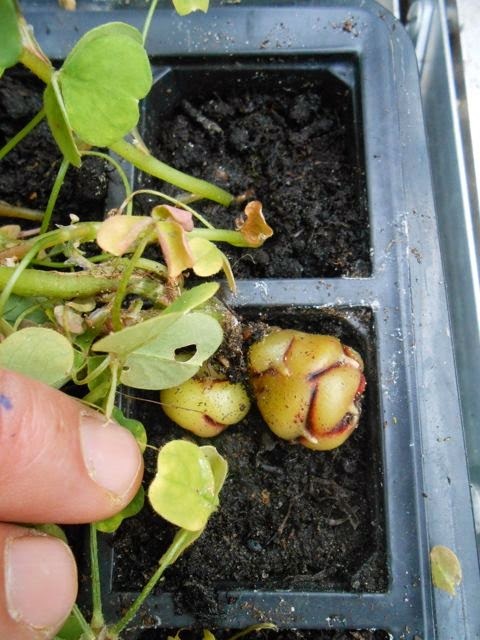 Back in the autumn, I pricked out a whole load of late-emerging oca seedlings into some modules; I realised there was no chance these minuscule waifs would survive the winter in situ. Although adding an extra eighty ocas to my swelling brood seemed foolhardy, I constructed a makeshift cold frame and left them to it. This was probably a mistake, as I became rather attached to them as the weeks passed. They actually grew quite well and the cotyledons were overtopped by flushes of fresh trifoliate leaves. Then, as the weather became colder, I feared for their survival. After a bit of head scratching, I devised a cunning plan to transfer them to a greenhouse at a nearby institute of higher education, where I have sympathetic contacts. When I say nearby, I mean a train ride of about half an hour. Being true-to-form, self-contained Brits, not one of my fellow passengers commented on the trays of seedlings perched precariously on my lap as I made that journey on two consecutive days. For that I was duly grateful. 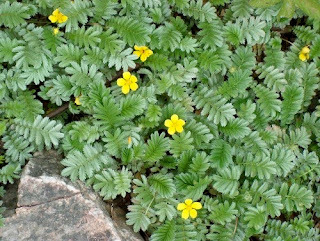 Once ensconced in their new home, the seedlings grew rapidly, despite the shortening days of November and December. Then, just before Christmas, they were cruelly evicted in a moment of high pathos of which Dickens would have been proud. I managed to find them alternative accommodation, however and they have dwelt happily in their second location for the last two months. The temperature inside seems to have hovered around a snug 10 ℃ for most of this time. To be honest, it hasn't been that much colder outside during this period. 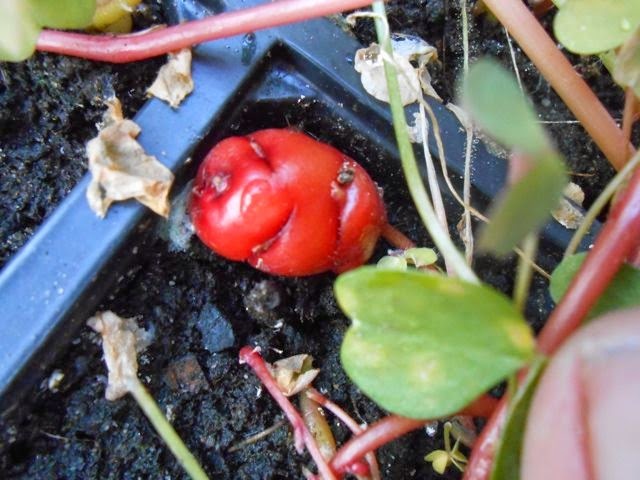 In any case, this has seen the plants through the darkest days of the winter and I'm happy to report the presence of a number of oca mini-tubers. See below for selected highlights. The largest of these started forming tubers quite early on; others have been slower to develop. I suspect that this is a result of their relative ages, some plants having been much larger than others when I saved them from imminent oblivion. I'll spare you any more gratuitous ocaporn; suffice to say, I now have another 70 or so oca varieties to plant out somewhere, anywhere. 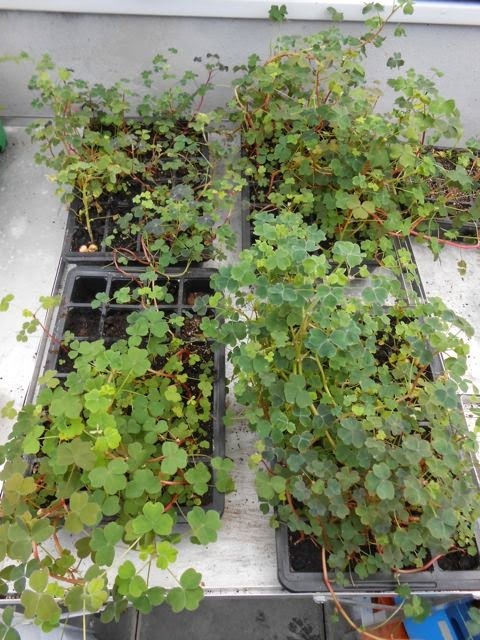 So it should, in theory at least, be possible to set up a continuous production cycle with a couple of generations of oca seedlings per year, if facilities are available. I am happy to take on the role of oca propagator in chief , if you could just see you way to adding some money and greenhouses. Interesting. So I can just add oca to my indoor growing system ;) Yes, getting attached to seedlings has its dangers but also its rewards. Thanks for your kind comments. Ocaddiction is, I'm afraid, a terminal condition. Once you get your own seedlings going, you'll find your desire to do housework, eat regularly and communicate with friends and family will all fade away. You have been warned. Narf7 from The Road to Serendipity recommended your site to me and I've been enjoying several of your past posts (also your other blog). I would have asked you about the seedlings, too, being Canadian and not stoic, either. I also would have commented, and I'm a stoic Brit! I also an about to move into a new house with marginally more garden space and am looking to begin experimenting with interesting root crops, though on a much smaller scale than yourself! I'm not sure I'd be much use to you interms of greenhouse space though. I'm sure I could spare a few tubers later on.